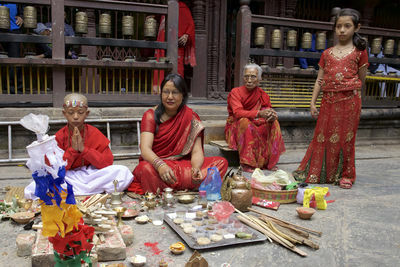 More than 80% of the population in Nepal is Hindu and the rites and rituals influence all aspects of people's lives. This photo collection provides a brief glimpse into a few of the defining moments in Hindu life from the rite of passage of the boy, through an example of one of the numerous festivals to death and cremation. Young Hindu boy supported by his family goes through the rite of passage at the Golden Temple in Kathmandu on 2 April 2015. 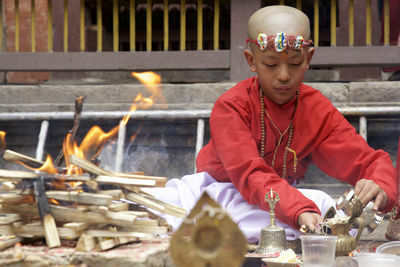 Young Hindu boy goes through the rite of passage at the Golden Temple in Kathmandu on 2 April 2015. Grandmother and grandchild at rite of passage ceremony for brother/grandson at the Golden Temple in Kathmandu on 2 April 2015. Woman stirs a fire pot at a Hindu religious festival in Kathamandu on 2 April 2015. 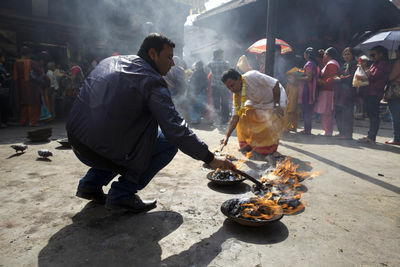 Fire plays an important role in the worship of deities through sacrifices and offerings. Two Hindu men stir the fire pots at a Hindu religious festival in Kathamandu on 2 April 2015. 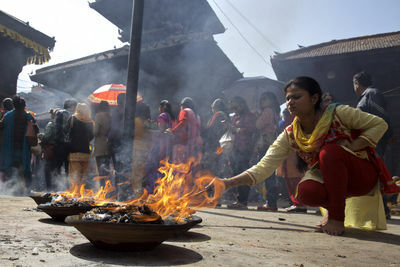 Fire plays a role in the worship of important deities through sacrifices and offerings. 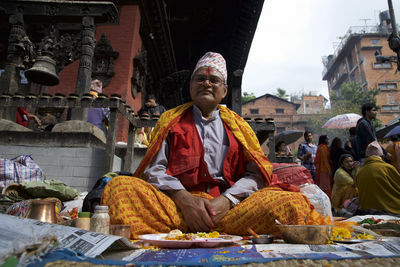 A man from the Brahmin caste taking part in a Hindu festival in Kathmandu on 2 April 2015. Despite a move from the traditional caste system towards a more economically based class system, the Bramins are still well represented in the top layer of the Nepalese society. 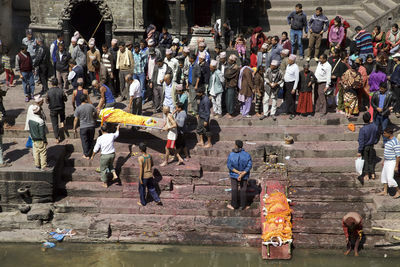 Burial rites performed at the Hindu Pashupatinath temple in Kathmandu on 11 March 2015. A nearby hospice located on the temple grounds represent for many Hindus in Kathmandu the last stop. The body is then wrapped in cloth and brought to the river to be ritually washed before it is brought to the funeral pyre and burned. 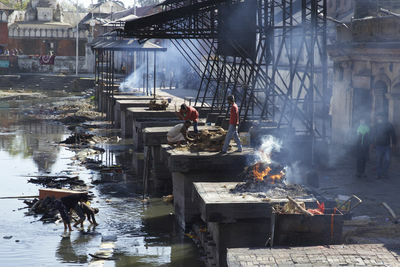 The wealthier Hindus have their deceased family members cremated on the piedestals along the river bank at the Hindu Pashupatinath temple in Kathmandu. The body is placed on a funeral pyre and cremated. The remains are unceremoniously swept into the river, once the family is gone and the fire is out. Kathmandu 11 March 2015.